The Vickers Viscount was the first postwar turboprop airliner to enter service in Australia and its' arrival signalled the beginning of the end of the piston engined airliner in Australia. First flown in 1948, the Vickers Viscount was designed by Vickers in the UK in response to the Brabazon Committee’s recommendations on post-war airliner requirements. The prototype first flew on 16 July 1948, and 444 were produced before production ceased in 1962. Powered by four Rolls Royce Dart turbo-prop engines, the Viscount was widely used in Australia by TAA, Ansett, Butler Air Transport, MacRobertson Miller Airlines and the RAAF. Seating was usually provided for 47 passengers. Following a series of accidents, the early Series 700 Viscounts were grounded in Australia, although the later 800 series continued to operate successful. The Viscount was a dominant force in the Australian domestic airline industry, competing against DC-3, DC-4 and DC-6B airliners. A total of 31 civil Viscounts flew with Australian Airlines from 1954 to 1970, and at the time of placing its Viscount order, TAA became only the fourth airline in the world to purchase a non piston engined airliner. The RAAF purchased two V.816 Viscounts for VIP use in 1964, as A6-435 and A6-436. The Museum’s Viscount was built in 1958 as a V.818 and was delivered to the Cuban National Airline, CUBANA, as CU-T622 in August 1959. During its Cuban service the Viscount is thought to have acted occasionally as the personal transport of Cuban Dictator, Fidel Castro. 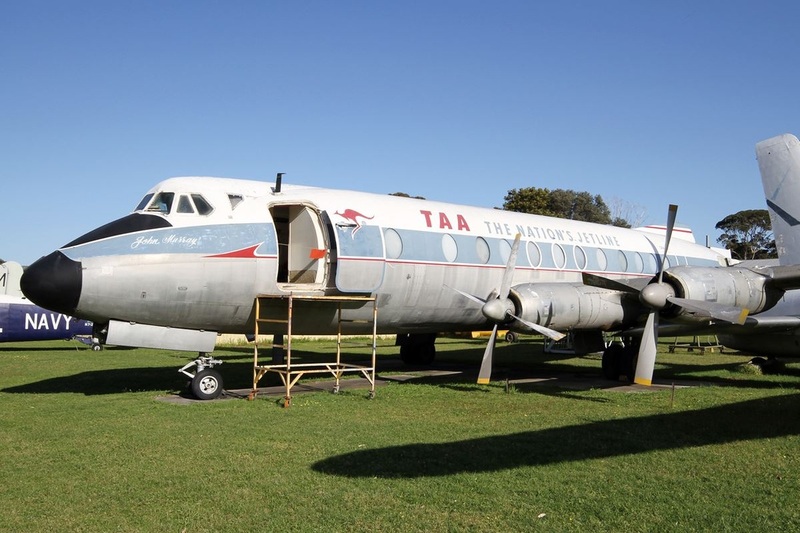 Following delicate negotiations, the Viscount was purchased by TAA in 1961 and flown to Australia where it was registered VH-TVR and named “John Murray” as a converted V.816 Viscount. 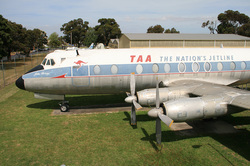 It was retired in February 1970 and was donated to the Museum by TAA in 1971. Many will remember that for years this Viscount was a feature of the Wobbies World amusement park in Vermont. It is currently undergoing a major internal restoration.